Mama is in town and everyone is THRILLED!! These kids know how to make a grandma feel loved - and I'm a far second in comparisons. Now for her to last 10 days of being a human jungle gym. She even gets Wade snuggles - I try snuggling him and he tells me to, "no touch me." Blake finally decided that walking might be an executable form of transformation. She's not full on walking yet, but she's getting so close. Jacqueline also thinks walking is pretty cool, but she's fully reliant on an adult (not toddler) helping her every step of the way. Jacqueline frequently needs to take a little rest on the ground. She also does this when trying to look under doors or the couch. Being so curious is so exhausting. There's been a lot of high chair corralling going on around here. Usually it's Blake, they're her favorite walker toys - but Wade obviously has to take over in usual older brother booger fashion. I believe that pushing in chairs does wonders in making a space look cleaner - well, those days are over. I suppose those days have been over for a while, but, it's just another step down the rabbit hole. We had a little mishap this week with me buying girl halloween jammies and I didn't realize it until he was wearing them and falling in love with his "punkin" shirt. You can tell by the ruffles...and the trace amounts of glitter. Oops. He found the headband on his own. Keeping this gem for some future blackmail. We watched conference this weekend. It's interesting with three kids. I bought Wade a puzzle that kept him rather entertained and he loved hanging with Daddy. The girls were extremely distressed (ticked off, actually) that we wouldn't let them play with the computer. 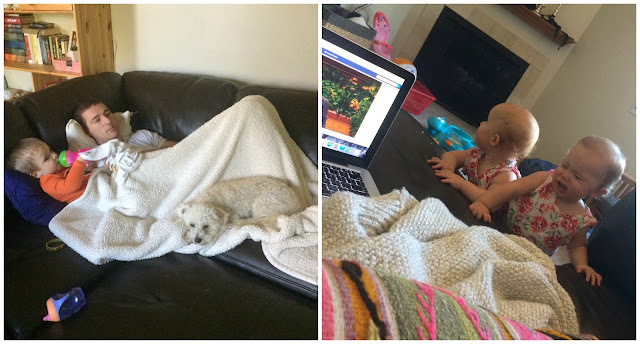 By some miracle all three kids slept during the two afternoon sessions, it was amazing - I actually got to listen! Wade's been making "brownies" a lot this week. It consists of random food that he rummages and often ends up with water in it to make it extra nasty. Yesterday he found my salad spinner and had this one sided conversation with me, "I making po'corn! It waters and ketchup and waters and mustards and ... and, more waters! Oops, I make big mess. I get towel. I get two towel, it big mess." Haha. However big the mess was, he cleaned it up! 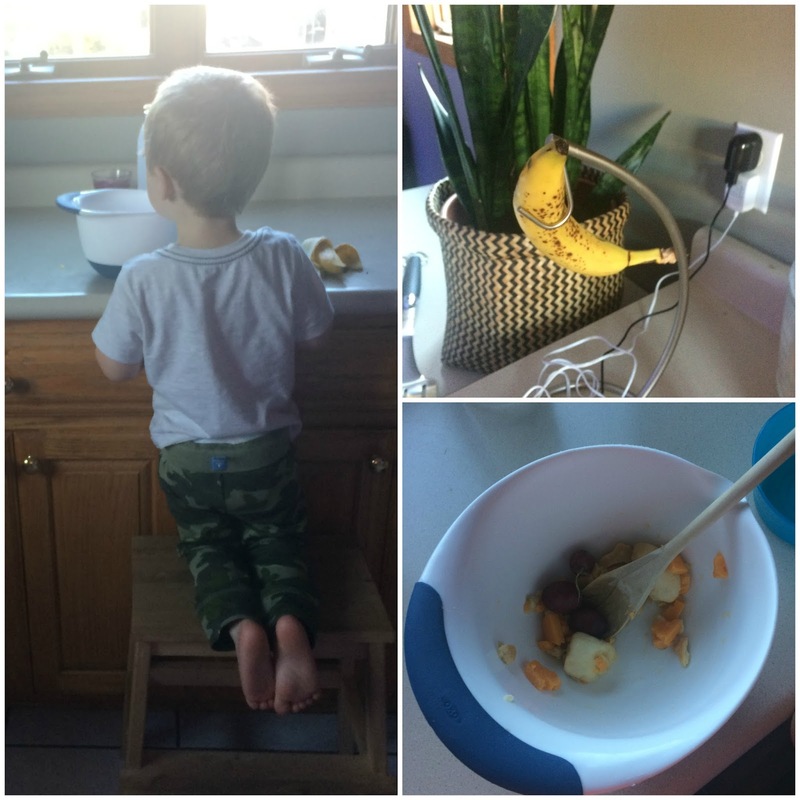 During one of these cooking sessions he couldn't figure out how to rehang a single banana (his nightmare), I watched him try to figure different things out and kept saying, "That not right. No, no, that doesn't work. That NOT RIGHT!" I stepped in as things started to spiral and tears welled up. We finished our dog fence! Now to train Stella - cause you can tell by her current behavior that we're great at training her. I cut my foot on a picture frame and poured hydrogen peroxide on it - I thought hydrogen peroxide didn't sting! I could see me at some point in the future pouring it on a kid and them crying and me telling them that it doesn't sting and to stop being a baby. That scenario will not happen now, cause holy crap that stings! Now that I think about it, I'm pretty sure that exact situation happened a few months ago with Husband. Maybe I should apologize...and admit I'm wrong? Eh, it's in the past, I'll let it lie. I'm so excited for this week with my mom. Is there anything better than watching your kids play with your mom? Wade decided her name is "Mama" and I love hearing him say it and how in his mind it's entirely different from what he calls me "Mommy." He has to follow her everywhere. She has so much energy to keep up with him and play with him - she even played CandyLand with him, ever play a boardgame with a toddler? Blake and Jac both crawl right to her and keep making sure that she's watching them do their tricks. This is going to be such a good week. I LOVE when Grandma comes to town. They love our babies like no other!